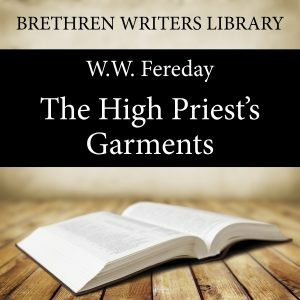 In ‘The High Priest’s Garments’, W.W. Fereday illuminates the typical character of the ancient ritual. Because Israel's ritual pointed to Christ, the smallest details are given. Nothing is too small for notice that in any way speaks of God's beloved Son. Let us clearly understand where priesthood comes in, in the ways of God. When Israel was in Egypt, groaning under the yoke of Pharaoh, God did not provide a priest but a saviour. But when the people were delivered, having come under the blood of the Lamb, and having passed through the Red Sea, then — and not till then — did God say anything about a priest. In like manner today, the Saviour is God's provision for the burdened sinner, and the Priest is God's provision for the delivered saint. It is the “holy brethren, partakers of the heavenly calling,” who are exhorted to consider the Apostle and High Priest of their confession (Hebrews 3:1). Priesthood is not designed to bring men into relationship with God, but rather to help those who are already in relationship with God. A word about the author: William Woldridge Fereday (1863 - 1959) was born in England. He was saved at the age of 16 and almost immediately started to preach and he spent the whole of his life in the study and exposition of the Scriptures, travelled extensively and spent a considerable time in Scotland and the continent of Europe. His written ministry is well known for being brief and succinct as well as precise and accurate and always scripturally sound and Christ-centred. He has written many articles and booklets which include a very profitable series of Scripture Character studies. This book is part of the Brethren Writers Library series. These books go forth with the purpose of introducing the listener to the writings of men who were gifted of God as teachers ‘for the perfecting of the saints, for the work of the ministry, for the edifying of the body of Christ’. Many of their writings are freely available online at Stem publishing.com. Words by the Wayside, 2015.